(a) By how many percent is the torque of a motor decreased if its permanent magnets lose 5.0% of their strength? (b) How many percent would the current need to be increased to return the torque to original values? This is College Physics Answers with Shaun Dychko. The torque on a current-carrying loop is the number of loops times the current times the area enclose by the loop times the magnetic field strength times sine of the angle between a perpendicular to the area and the magnetic field. Now, in this question, we're asked to find out what is the percent change in the torque given a certain change in the magnetic field. So percent change is the difference in something divided by its original value and we'll times by a 100 percent. And so that is torque two minus torque one over torque one. And torque two is NIAB subscript two because the magnetic fields is different in case two compared to case one and then times by sine theta minus NIAB1 sine theta and the N, the I, the A and the theta do not need subscripts because they are the same in both cases. The only thing changing is the magnetic field. And then lots of things cancel here, this works out to B2 over B1 minus one. And so B2 we're told is five percent less than B1 and so it's B1 minus five percent of B1 and that makes 0.95 percent of B1 is B2. 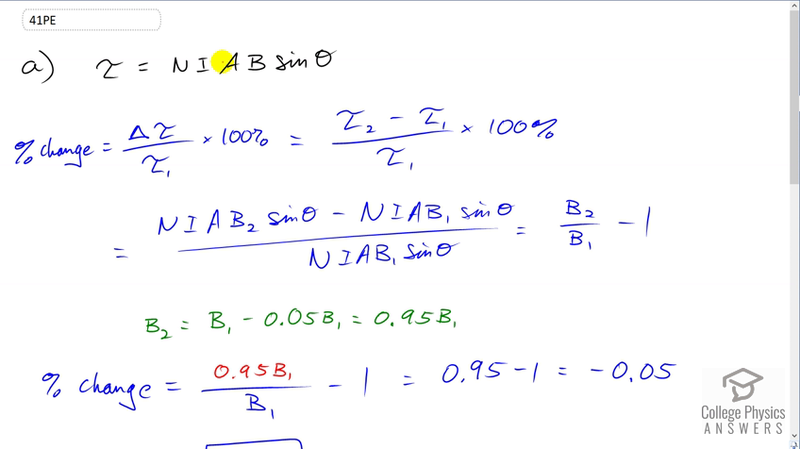 So, the percent change then is substituting for B2 as 0.95 B1. B1 is cancel here and we're left with 0.95 minus one which is negative 0.05, which is negative five percent. So the change in the torque will be a reduction in five percent when the magnetic field is reduced by five percent. Now, in part b, we're asked what percent increase in the current will be necessary in order to have the same torque in case two with this reduced magnetic field as the torque we had in case one. So torque two is now this formula here but we have a subscript on the current now, because it's going to be different on the current in case one and may have a subscript on the magnetic field as well. And so the torque two is meant to equal torque one we're told. And torque one is NI1AB1 sine theta. And so equating these two things here on this line, we can see that a bunch of things cancel on both sides and current two then will be after we divide both sides by B2. It will be I1B1 over B2. Now, B2 we know is 0.95 B1, that's what we set up here. So this makes I1 over 0.95. So that's what current two is going to be. But we want to present change in the current needed. So, we have I2 minus I1 divided by the original current I1 and that is one over I1 over 0.95 minus I1, all over I1. And this works out to one over 0.95 minus one which is 0.05263 which has a percentage of 5.26 percent. So the current needs to be increased by 5.26 percent, in order to compensate for the five percent reduction of the magnetic field, in order to have the same torque as we had before.